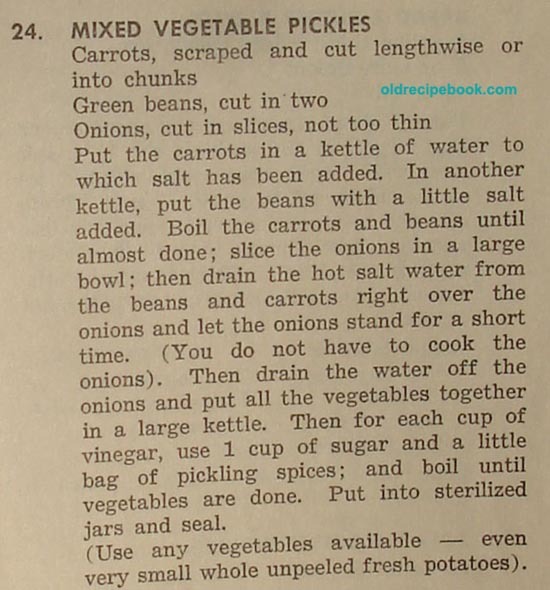 On this page is a variety of other vegetables and things you can pickle, and see the bottom of the page for my favorite pickled fish recipe. Who would have thought that there are so many different varieties of things to pickle? 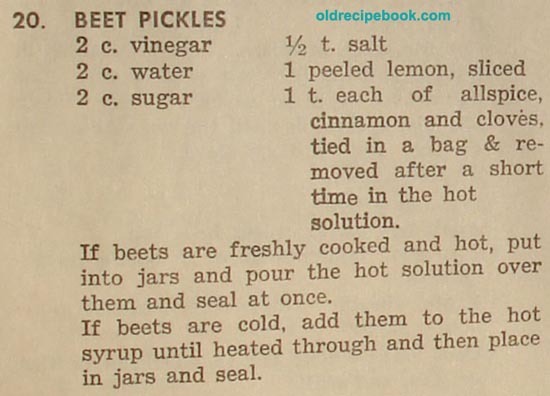 I have ran into so many recipes, especially pickled beets, in my recipe books, it would be hard to add them all. So, I am pretty much adding recipes that are easy, or interesting. I also found it curious that some people call them Pickled Beets and some call them Beet Pickles, but it seems they are pretty much the same thing. Cook beets with roots about 2 inches of stem until tender. Use enough water to cover. Dip in cool water and peel. Combine sugar, spices, vinegar, and add beets and simmer 15 minutes. Pack beets into hot sterilized jars and cover with boiling hot syrup. Seal. To cook beets wash and drain, leave 2 inches of stems and the tap roots. Cover with boiling water and cook till tender. Combine all ingredients, except beets; simmer 15 minutes. Pack beets into hot jars, leaving 1/4 inch head space. (Cut larger beets in half, if necessary) Remove cinnamon. Bring liquid to boiling. Pour, boiling hot, over beets leaving 1/4 inch head space. Adjust caps. Process pints and quarts 30 minutes in boiling water bath. Yield about 6 pints. Let 1 cup sugar and 1 cup vinegar come to a boil. Drop beets in vinegar and sugar, boil again. Drop beets in hot pint jars, drop 8 to 10 red hots (cinnamon flavored) in each jar, add the hot cider vinegar and seal. Cook small beets until tender. Put into cold water and slip off skins. Cover with spiced vinegar. Simmer 15 minutes. Pack beets and liquid in jars. Seal. This is enough syrup for approximately 6-8 pints of beets. Beet Pickles 20 - This recipe has sliced lemon in it and the beets can be packed hot or cold. Pickled Beets 21 - Cook small beets until tender. Slip skins off. Make a pickling syrup of 2 c. sugar, 2 c. water and 2 c. vinegar, 1 T cinnamon, 1 t. cloves and 1 t. allspice. Cover beets with this syrup and simmer for 15 min. Seal. 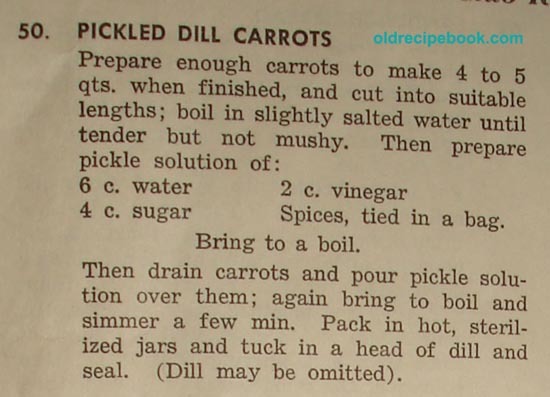 (This same recipe may be used for pickling carrots and beans). My Note: This is the recipe I use most of the time. Cook carrots until just tender. Drain and remove skins. Leave small carrots whole; cut larger ones into pieces as desired. Combine sugar, vinegar, water, and salt. Ties spices in a cheesecloth bag; add to vinegar mixture. Boil 5 to 8 minutes. Pack carrots into hot jars, leaving 1/4 inch head space. Remove spice bag. Heat syrup to boiling. Pour, boiling hot, over carrots, leaving 1/4 inch head space. Adjust caps. Process pints and quarts 30 minutes in boiling water bath. Yield about 3 pints. Also see: Pickled Dill Carrots - These are sweet dilled carrots. Pickled Yellow String Beans - This is a very simple recipe if you like sweet string beans! Dill Pickled Green Beans - Pickle your green beans with this easy recipe. Peel small white onions, cover with brine, allowing one and one-half cups salt to two quarts boiling water, and let stand two days; drain, and cover with more brine; let stand two days, and again drain. Make more brine and heat to boiling-point; put in onions and boil three minutes. Put in jars, interspersing with bits of mace, white peppercorns, cloves, bits of bay leaf, and slices of red pepper. 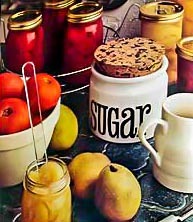 Fill jars to overflow with vinegar scalded with sugar, allowing one cup sugar to one gallon vinegar. Seal while hot. Boil 2 parts water to 1 part vinegar. Cut peppers in half or quarters. Place peppers and garlic in sterilized jars. Pour liquid over peppers and seal. Mixed Vegetable Pickles - Use any vegetables available. Even small unpeeled potatoes. Dissolve salt in cold water. Pour over prepared vegetables. Let stand 12 to 18 hrs. in a cool place. Drain thoroughly. Add spices, hot red pepper and sugar to vinegar, boil 3 minutes. Add vegetables; simmer until thoroughly heated. Pack, boiling hot, into jars, leaving 1/4 inch head space. Remove air bubbles. Adjust caps. Process 15 minutes in boiling water bath. Yield: about 6 pints. 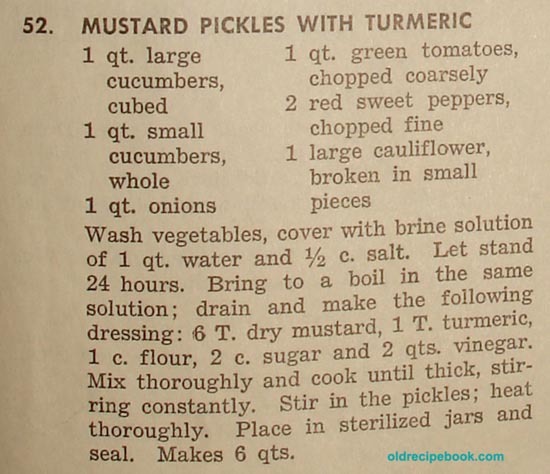 Here's another recipe for Mustard Pickles with Turmeric - This recipe calls for flour in the dressing that you mix and can with the veggies. 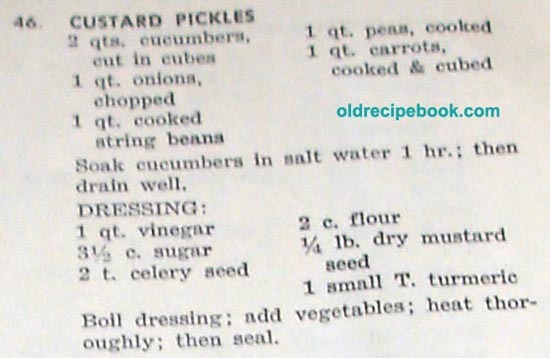 Custard Pickles - This is an interesting recipe, I think it's a misspelling, and it should say Mustard Pickles, but maybe not. It's pickled vegetables in a dressing. The dressing has 2 cups of flour in it! You pour it in, then can it! Remove outer leaves, core and shred cabbage. Place in large bowl, salting each layer. Cover and stand in cool place 24 hrs. Drain thoroughly and place on paper towel lined trays or wooden boards 6 hours. Pack in hot jars, leaving 1/4 inch head space. Put remaining ingredients and spice bag in large sauce pot. Boil 5 minutes. Remove from heat and cool to room temperature. Remove spice bag and pour liquid over cabbage, leaving 1/4 inch head space. Adjust caps. Process quarts 20 minutes in boiling water bath. Yield about 5 quarts. 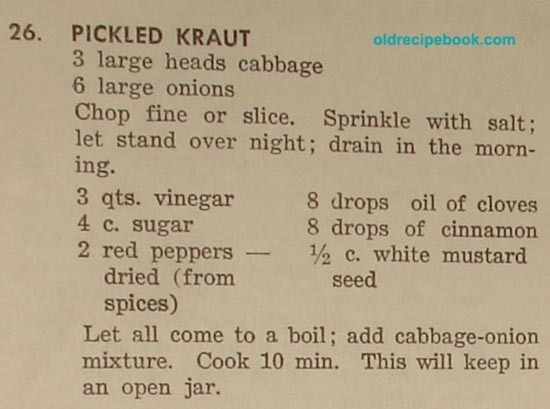 Pickled Kraut - This is sweet, and can be kept in an open jar. Uses oil of cloves and oil of cinnamon. Remove shells from eggs. Boil vinegar and add seasonings. Pour in a glass jar. Drop in eggs. Cover and let stand at least 10 days before serving. If desired, several cloves may be stuck in each egg before they are put in the vinegar. 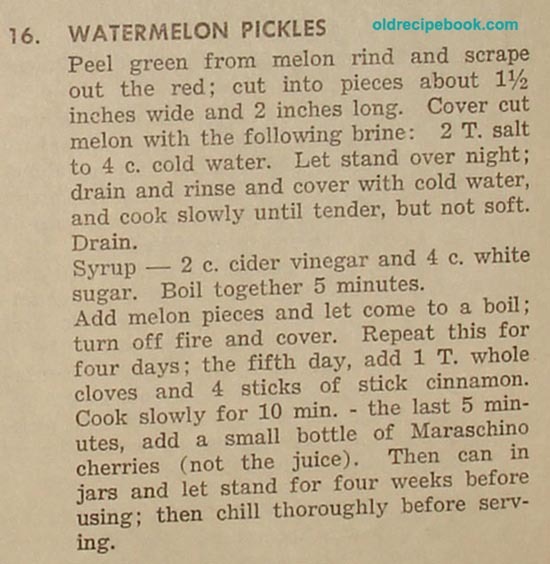 Watermelon Pickles - This recipe is a 5 day recipe, plus you add a jar of Maraschino cherries. 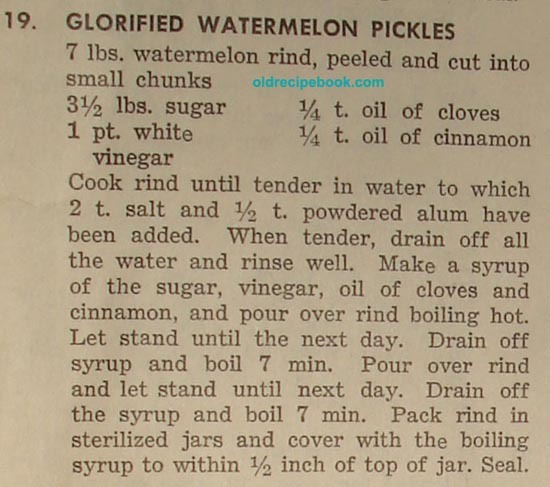 Glorified Watermelon Pickles - Two day preparation, uses oil of cloves and oil of cinnamon. 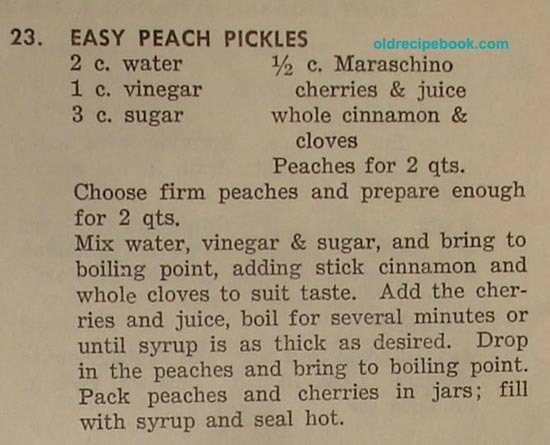 Easy Peach Pickles - This is an interesting recipe. I may make this sometime! Don't know what to do with that big catch of the day? This home canning recipe is simple to do, and it lasts a long time in the refrigerator. It's just as good as the marinated herring in the store. Fillet the fish and take the skin off. Cut the fish into very small pieces. Fill a quart jar 3/4 full with fish and onion slices. 2 teaspoons mixed pickling spices and 1/2 cup sugar. Then fill the jar with white vinegar. Put the cover on the jar. Shake jar occasionally every day. Ready to eat in 4 days. Lasts in the fridge a long time. My Note: I tried making this with some thawed Cod fillets from the store, and it was tough. So, I guess fresh fish is the way to go.